Recently, I found a little camera I used to carry with me when I went out west. I put the memory card into my computer and found 127 pictures on it. One of them was of the Colorado River. The Colorado River is located on the state line between Arizona and California. Goose Lake, Willow Lake, Beal Lake, Topock Bay and Lost Lake, all is connected to the Colorado River, which drains into Lake Havasu. Sometimes when we would cross, the water would be very green, on this trip, it wasn’t. We would stop at the truck stop about 2 miles into Arizona. Its a beautiful area and everyone needs to visit if in the area. 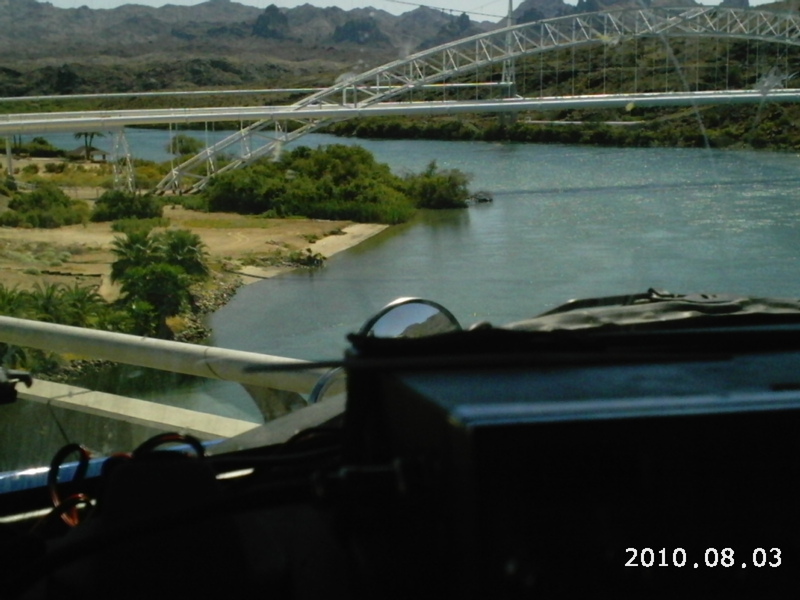 This entry was posted in Trucking and tagged Arizona, California, Colorado River, Lake Havasu, truck stop. Bookmark the permalink. Great photos you have taken. I never get good ones as I cross over. You are correct. The color changes with the water temperatures. In mid to late summer it is a blue green. In fall and winter it is a beautiful blue. When I see people on jet skis heading toward the bridges in the heat of summer I always wish it were me on that jet ski cooling off. So glad you are sharing your older photos. Always a story hidden in them.